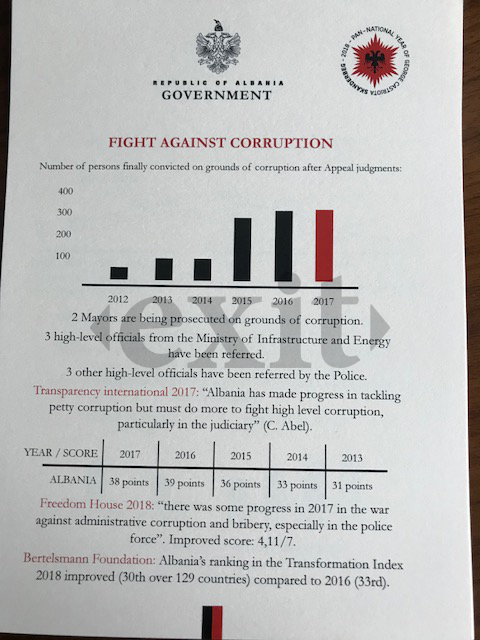 A fact-finding mission of the Dutch Parliament recently arrived in Tirana to gather data concerning the real progress of Albania after the publication of the Progress Report by the European Commission. Exit.al has obtained the handouts provided by the Albanian government to the mission of seven Dutch MPs, which includes representatives from all four government coalition parties. As may be expected, the data were selected to project a positive image of the government’s efforts, glossing over the major issues with the compliance to the five key criteria set by the previous Progress Report. First of all, the handout claims that “the implementation of the vetting process started in 18 January 2017.” It is unclear what started at that date, but it is a fact that the vetting institutions were only nominated in June 2017, their office building was only completed in October, and the first dossiers were selected by lottery in November. As I have argued before, the many delays with the vetting process have led to an unconstitutional situation at the Prosecution Office and a crippling absence of the new judicial institutions mandated by the Constitution. In the handout, the government further claims that it “has increased financial, human resources and logistical support to the vetting institutions” to the amount of €4 million in 2017. These numbers are difficult to check, as government’s budget allocations are decided by the Council of Ministers rather than Parliament, but we do know that in September 2017 the government actually refused to grant the budget funds and personnel requested by the vetting institutions and their international partners, slashing the number of employees and the budget by 40 per cent. 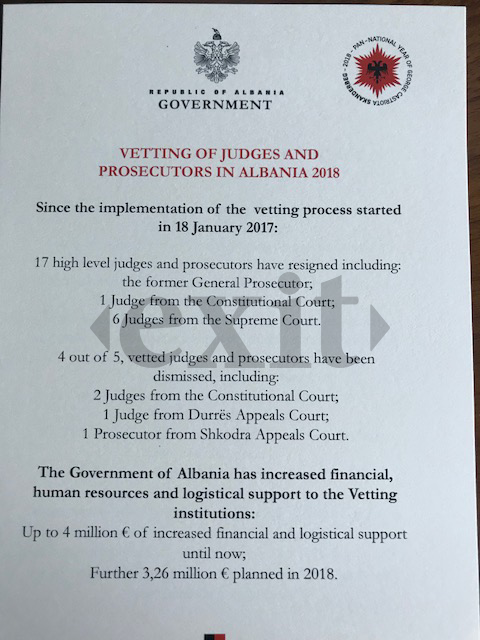 As a result, as has been recently pointed out by the Albanian Helsinki Committee, the vetting is progressing much slower than anticipated, which poses a very real threat to guaranteeing human rights in Albania, including the right to a fair and timely trial. As may be clear from the incessant stream of international reports, Albanian organized crime is on the ascendancy throughout the EU, mainly as the result of enormous profits reaped by marijuana cultivation and trafficking between 2014-2017. This was a profitable business that reached up to the highest levels of government, as evidenced by the criminal investigation of former Minister of Interior Affairs Saimir Tahiri, and several State Police directors. As a result, Albania has one of world’s highest cocaine consumption levels per capita and is still the no. 1 exporter of marijuana to Europe. On the handout, the government has tried to counter this disconcerting reality by presenting unverifiable data regarding homicides. 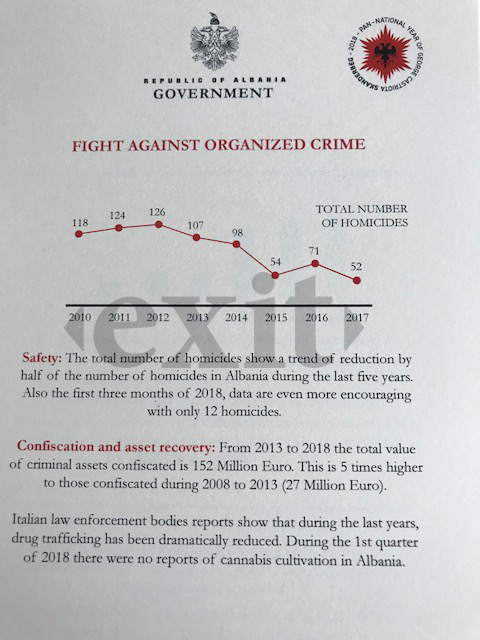 There is no correlation between the international expansion of Albanian organized crime and the number of homicides in Abania, and therefore the little graph offers no indication of the government’s success in fighting it. 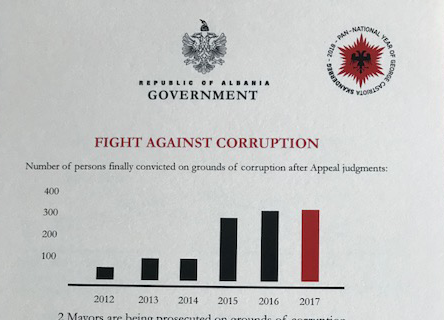 Again the government handout presents mostly irrelevant data, showing an increase in the number of persons receiving a final conviction on grounds of corruption. The far majority of these convictions are low-level civil servants, while the corruption at the top of the government flourishes more than ever. The Public Procurement Commission, controlled directly by the Prime Minister, has consistently handed out tenders to a small group of so-called oligarchs, through procedures in violation of both the letter and the spirit of public procurement legislation. All multimillion-euro concession projects tendered out by the government over the last years show serious deficiencies that solely profit the concession holders at the expense of Albanian taxpayers, and both the World Bank and the IMF have warned for serious long-term consequences of this form of financing. A recent report supported by the EU and OECD shows that no progress has been made in the professionalization of the public administration, with the reform implemented during Rama’s first mandate having ended up in complete failure. 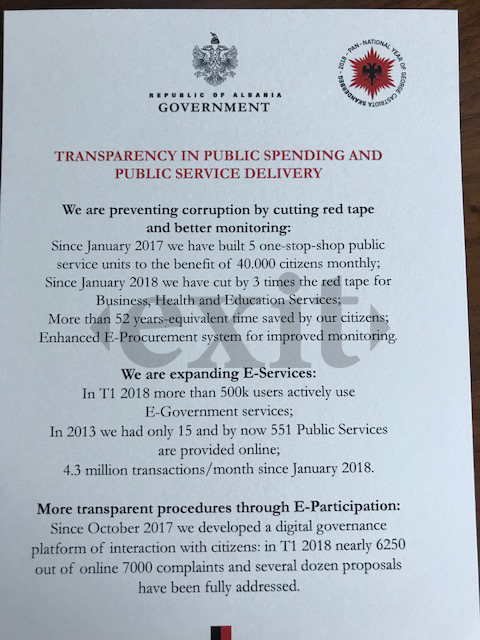 To counter the depressing state of affairs in Albanian public administration, Rama has brought out his favorite project, his co-governance platform, or as he calls it on the handout, “E-Participation”: “Since October 2017 we developed a digital governance platform of interaction with citizens.” He forgets to mention that there is no legal basis whatsoever for this platform, which bypasses Constitutional institutions like the National Ombudsman, and fosters a climate of nepotism by making ministers directly responsible for addressing ad-hoc “problems” of “ordinary citizens,” rather than developing long-term and properly implemented policies. Moreover, the government has urged citizens and even journalists to use the platform as a better alternative to Freedom of Information requests, which, different from the co-governance platform, still provide a relatively effective and legally secure to hold the government accountable. The handout of the government makes no mention of human rights. This is no surprise, as there is not even the tiniest piece of evidence for any improvement on that front. The documents given to the Dutch parliamentary mission clearly shows the desperate attempt of the Rama government to paint itself in a positive light, in spite of the massive evidence to the contrary.